Our awesome team of guiding physical therapists and volunteers are all smiles at our dance injury screening! March 23rd marked SPEAR’s collaboration with Columbia Dance Medicine on a complimentary dance injury prevention screening for the NYC community! 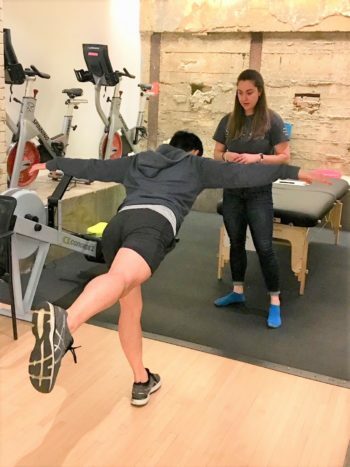 The second of its kind, our team of physical therapists volunteered to help the dancers evaluate their strength, flexibility, endurance, and balance. Many of the advising physical therapists on site were dancers themselves, pulling from their own personal range of dance backgrounds in ballet, Horton, musical theatre, salsa, and Irish step to guide participants through a series of assessment exercises. The team also recommended effective warm-up and conditioning practices, while asking questions to better understand not only dancers’ individual habits, physicalities, and experiences, but also the unique demands of their styles and training regimens. When beginning to train at such a young age, dancers may also develop a higher pain tolerance and have trouble distinguishing soreness that comes with building strength, from potentially concerning signs like sharp pain that may indicate something is wrong. “They’re so hyper-aware of every minutiae in their body, and they…don’t necessarily have the verbiage to explain how they’re feeling,”says Dr. Julia Iafrate of Columbia Sports Medicine. This can make it all the more difficult to address potential issues before they become major injuries requiring extensive rehabilitation, or to even know what questions are most useful to consider. A common question that arose during the screening, for example, is the minimum age at which young dancers should begin dancing en pointe (or on their toes). But as Dr. Iafrate points out, the answer often depends on many factors, including arch strength and ankle stability, that are more difficult to assess and do not consistently correlate with age categories. And while for many years, most forms of dance have incorporated static stretching into students’ warm-ups to improve flexibility, it is now common knowledge among most PTs and sports medicine doctors that static stretching, if not preceded by proper warm-up, can actually lead to more injuries. Upon reflecting on what she learned from the screening, SPEAR physical therapist Gwen Giffard laughed and remarked, “I learned it’s really hard to do an airplane test.” As our PTs rose to try the exercises they had just guided the dancers through moments before, one element became clear: finding opportunities to improve communication between dancers and PTs will undoubtedly improve a dancer’s overall health, and thus the longevity of their abilities to continue on with their passion. Our injury prevention screenings aim not only to help participants become more familiar with their own bodies, but to educate dancers, parents, and teachers. With the knowledge they acquire, they may better articulate and analyze their biomechanical inefficiencies, and thus make the most of their physical therapy sessions. 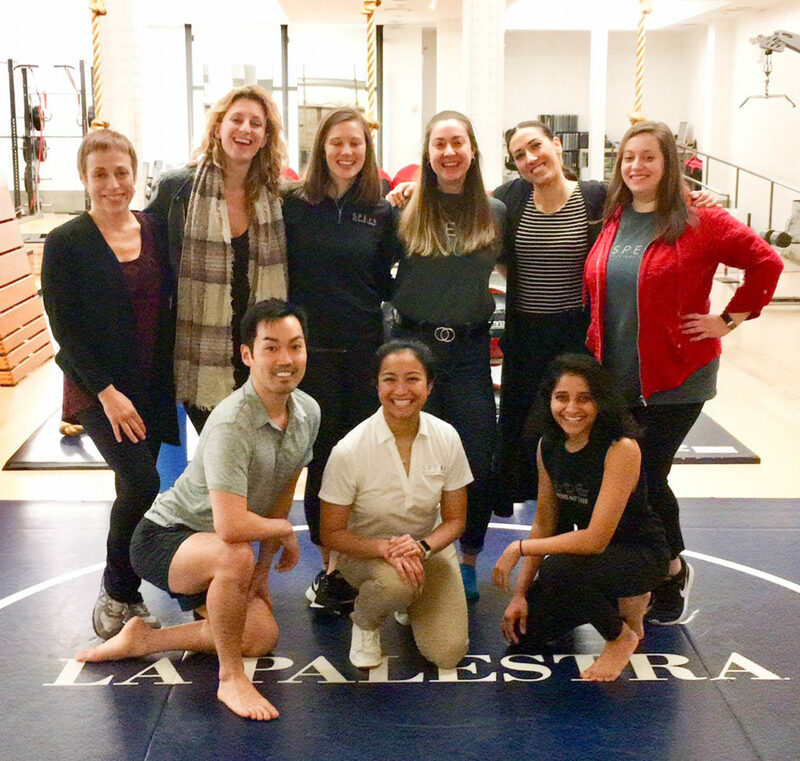 SPEAR’s budding dance medicine team hopes to encourage dancers to invest in more long-term relationships with their physical therapists so that we can work together not just for recovery, but for improved prevention of major injuries as well. Guest Feature - "Pelvic Girdle Pain in Pregnancy"
What is Pelvic Girdle Pain (PGP) in Pregnancy? The pelvic girdle is the ring formed by the bones of your pelvis. 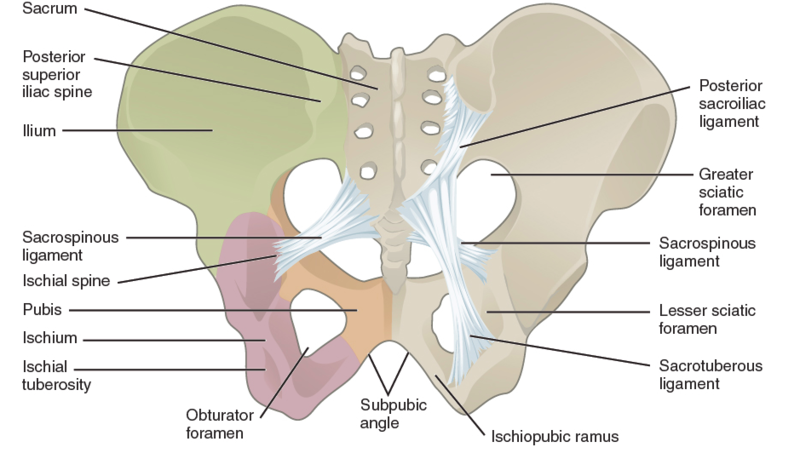 The ring has three joints (a connection between two bones), the two sacroiliac joints in the buttock area and the pubic symphysis joint in the front of the body. These joints are connected by ligaments that can loosen during pregnancy as a result of the hormonal changes that occur. When the ligaments are looser, they cannot hold the joints together as well and are more unstable. In addition, there is increased strain on the joints because of the growing baby and changes that occur in a women’s body to accommodate the enlarging uterus. For instance, the loosening of the ligaments allows for the necessary expansion of the pelvic girdle which allows enough room for the baby to pass through the birth canal during delivery. Pelvic girdle pain (PGP) is pain from the sacroiliac joints and/or the pubic symphysis joint that occurs because of the instability in and strain on these joints. It occurs in about 1 in 5 women and is more common in women with a history of previous back problems or an injury in the area. 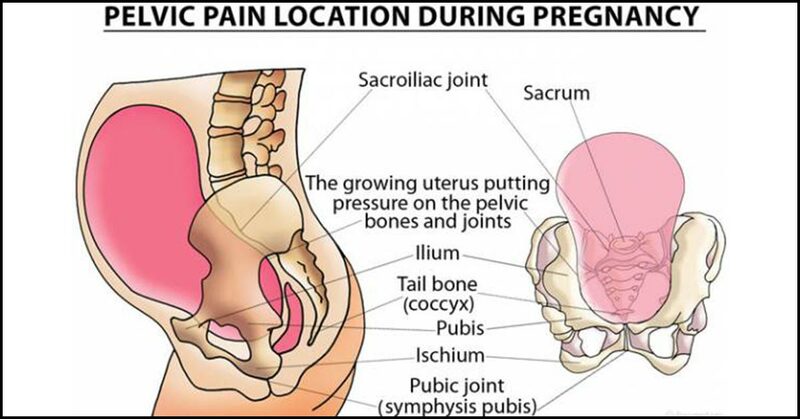 Pain in the sacroiliac joint is usually the cause of “sciatica” during pregnancy. What are the symptoms of PGP in pregnancy? Symptoms of PGP include pain in the buttocks and pubic bone that can radiate into the thigh, hips, or groin areas. Unlike true sciatica, PGP will not radiate past the knee. It is often increased with movement, especially when you move from one position to another such as turning in bed and going from sitting to standing. 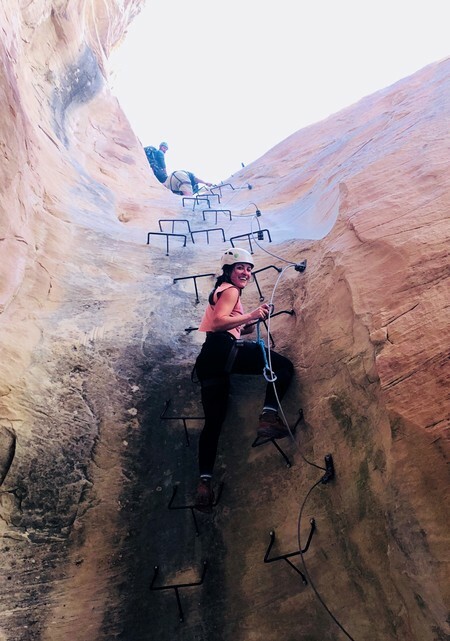 Women will also describe pain with activities such as with walking prolonged distances, climbing stairs, and standing on one leg to put on pants. Women may also experience clicking and grinding with any of these movements. Often, women will also have muscle aches in the buttocks in the inner thigh area because of strain and overuse of the muscles that need to do overtime to compensate for the loosened ligaments. PGP can be diagnosed by a practitioner who is trained to assess musculoskeletal conditions in pregnant women. Practitioners can base your diagnosis on the symptoms you are having combined with doing a physical examination. You do not need to have imaging or laboratory tests done to make a diagnosis of PGP. However, if some cases if pain is severe enough and symptoms are not improving with traditional treatments (see below), your doctor may order an MRI. MRIs do not have any radiation and are safe in pregnant women past the first trimester. What are the treatments for PGP? Education on ways in which you can and should move to avoid strain on the region. They will often go through everyday activities with you to help you determine which ones may be aggravating your symptoms and show you how you can do them differently to avoid pain. Exercises to strengthen and stabilize your core muscles. Your core muscles include the abdominal, back and pelvic floor muscles. These exercises will improve your spine, pelvic girdle and pelvic floor strength so that you have more support for the joints and ligaments that are being strained. It is safe to do certain core exercises but some can put a lot of strain on a women’s back or abdomen, which is why it is important learn how to do them correctly with a trained professional. These will not hurt the baby but may hurt the mother, if done incorrectly! Manual therapy (hands-on treatment) to muscles and joints. This treatment can release muscles that may be tight from overworking to stabilize joints and contributing to the pain. In addition, mobilizing joints in the pelvic girdle can shift bones into better position or help them move more normally. Support belts – there are many types of belts out there. You should work with your doctor or physical therapist to fine the one that is right for your particular issue. PGP usually gets better when you use a sacroiliac joint belt around the pelvic ring, rather than a supportive band for the belly. Warm baths – you should talk to your obstetrician and make sure you have no restrictions in taking a warm bath. These can be helpful to relieve muscle spasm and ease pain. Heating pads – should only be applied for short periods of time (15 minutes or less) and should never be placed over the abdomen directly. Ice packs – can be used a few times per day for symptomatic relief. Ice is the world’s most natural anti-inflammatory! If you use it over your pubic joint, you may even feel the baby kicking. Ambulatory assistive devices – this includes walkers, crutches, and canes. Using these may be temporary until your pain decreases with some of the other modalities, but can also be quite useful when walking longer distances is necessary. A stroller is kind of like using a walker so you may find your pain is better when using one. Acetaminophen – an effective over-the-counter pain reliever is considered safe during pregnancy and usually recommended by most obstetricians. You should always talk to your doctor though first before taking any medications. What type of delivery is indicated for PGP? A vaginal birth is considered safe and is the recommended mode of delivery in most women with PGP. There is no evidence that a Caesarian section is necessary and in some studies, there has been evidence that it slows recovery and prolongs healing of PGP. Will PGP go away after delivery? Thank you to Dr. Bonder for sharing her insight and knowledge! Did you know SPEAR has a dedicated pelvic floor physical therapy program? Learn about SPEAR’s pelvicore classes, view our expert specialists, or request an appointment today. You can also contac the pelvic floor team at pelvicfloor@spearcenter.com. Each year, SPEAR hosts a complimentary youth baseball injury prevention screening for the community. 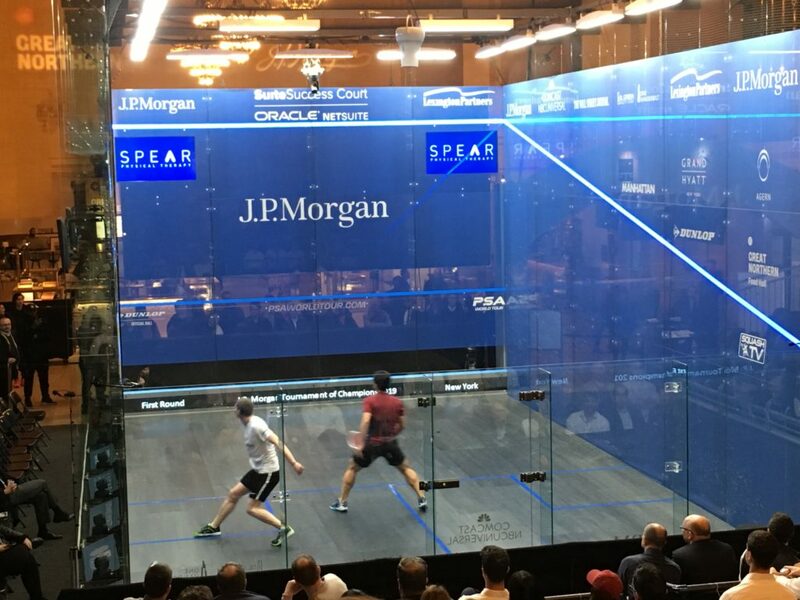 “This is our way of giving back to our community and SPEAR’s grassroots response to the alarming increase in throwing injuries,” says SPEAR CEO an Co-Founder, Dan Rootenberg. 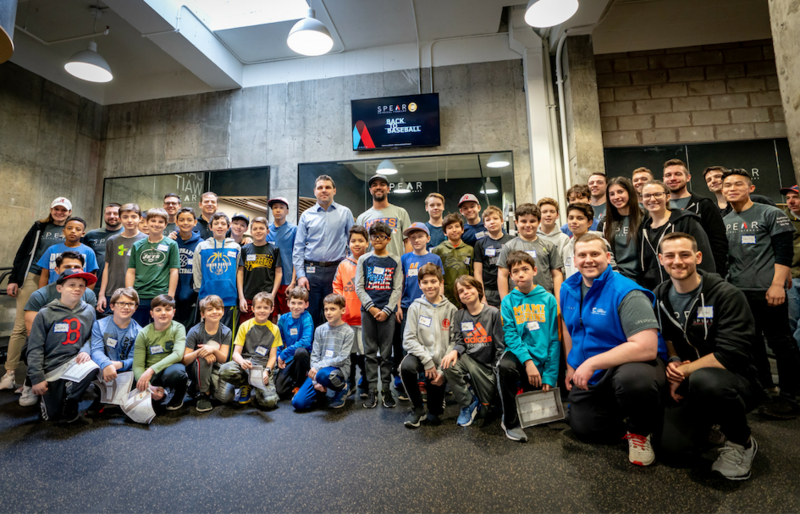 “Surprisingly, over 50% of all Tommy John surgeries are performed on teenagers.” The event was created to help young athletes; the focus is on optimizing performance and preventing injury for a fun and safe season. This year’s clinic was a total home run! Nelson Figueroa, current SNY broadcaster and former pitcher for the New York Mets, gives injury prevention advice to youth baseball coaches. 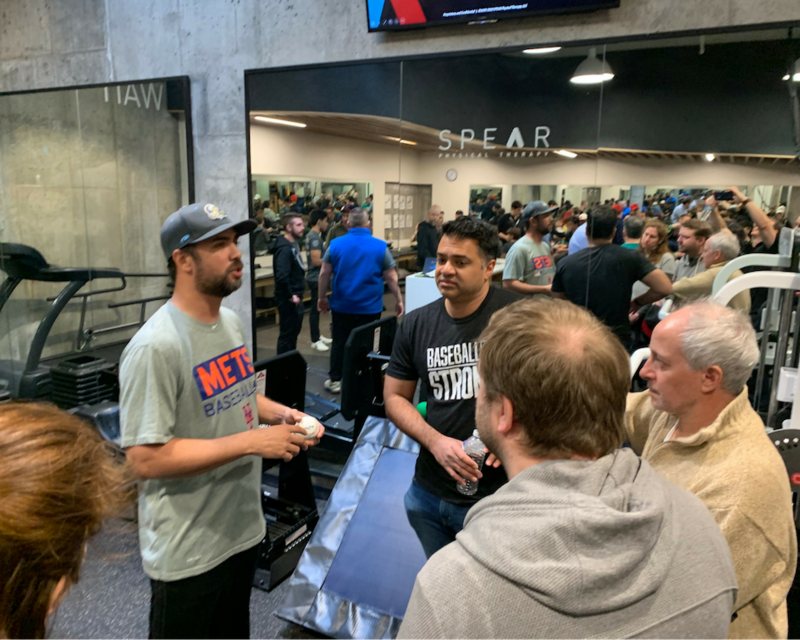 Over eighty attendees came together at our Murray Hill facility for expert guidance and insight on achieving their athletic goals safely. SPEAR’s CEO & Co-Founder, Dan Rootenberg, kicked off the event citing his experience throughout the years, including his time as a physical therapist at the World Baseball Clinic. 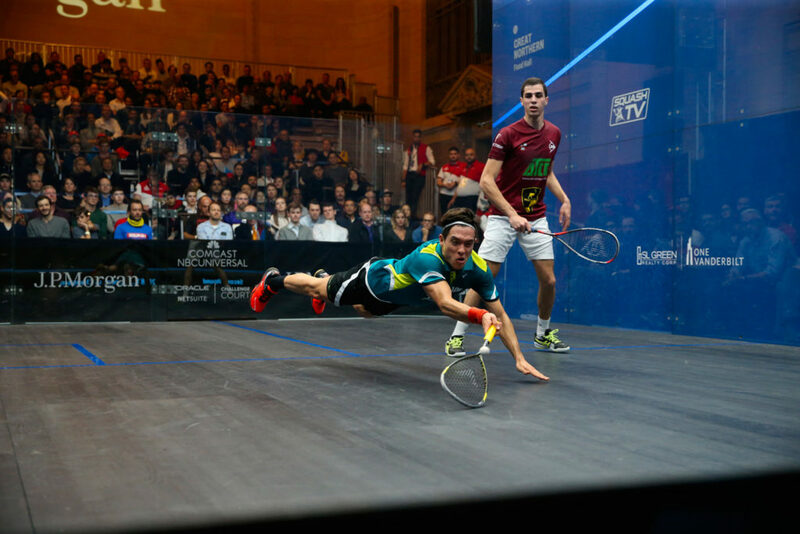 Dan has seen many injuries, some of which can take an athlete out for the season, or even altogether. It is vital for young athletes to learn the proper methods of injury prevention for athletic longevity; as the saying goes, an ounce of prevention is worth a pound of cure. 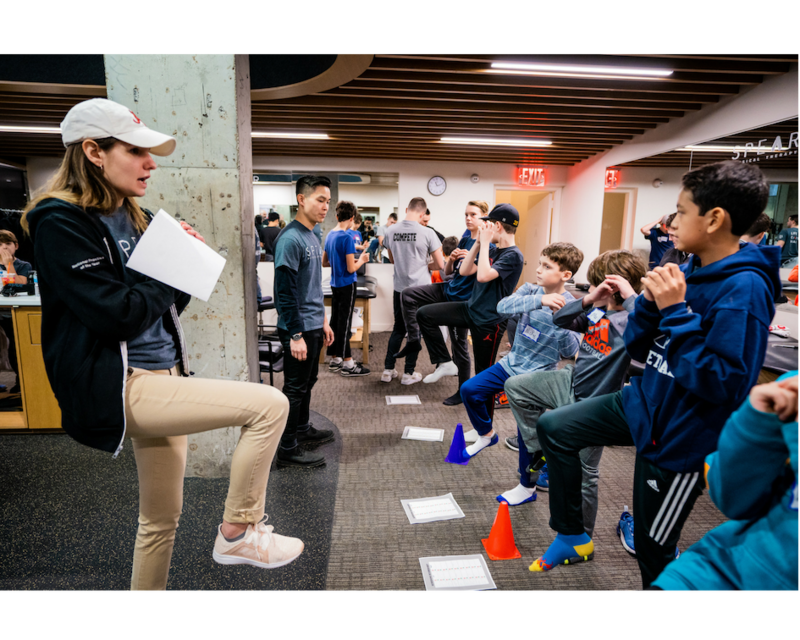 Our talented team of physical therapists administered hands-on guidance to the young athletes, performing detailed functional assessments, demonstrating proper methods of injury prevention and recommending exercise tips to follow at home for continual improvement. Over 80 attendees met former major leaguer Nelson Figueroa, and learned how to prevent baseball injuries for the upcoming season. 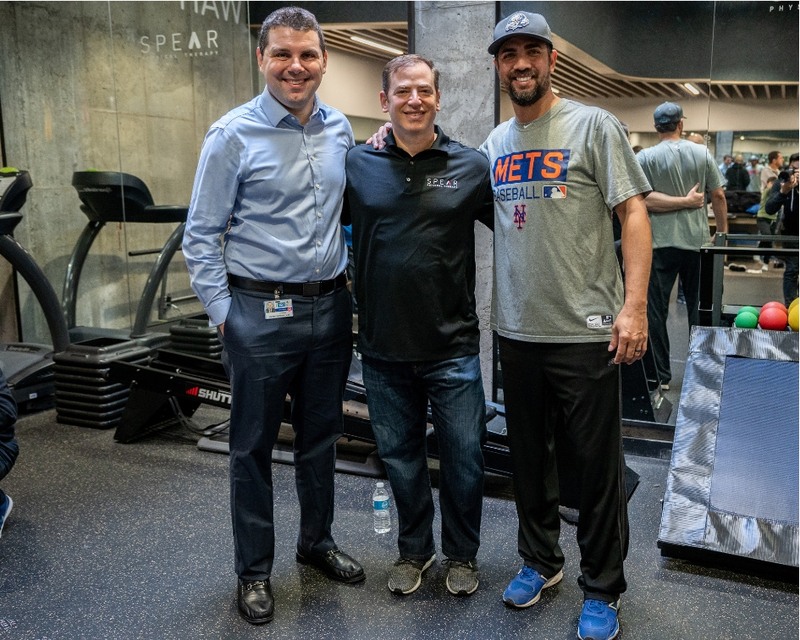 SPEAR was very excited to have a special guest participating in the event—we were graciously joined by Nelson Figueroa, current SNY broadcaster and former pitcher for the New York Mets. Nelson has led a very full professional career in major league baseball and was the first pitcher to throw a no-hit shutout at Citi Field! Nelson spoke to the group about his journey thus far, the injuries he has endured and the setbacks he has faced as a result. Reflecting on his experience, Figueroa shared a poignant anecdote: “Injury prevention is so huge because if you’re injured or you’re hurt, you fall out of love with the game.” It was an honor to have such a brilliant athlete contribute words of encouragement and inspiration to the youth group. SPEAR was also joined by Dr. Jonny Arnouk, current sports Orthopedic Surgeon at Mt. Sinai, who also holds a background working with professional sports leagues, once serving as a team physician for the Houston Astros. Dr. Arnouk contributed valuable advice and opened the floor up for questions on areas of focus and concern. It was a fantastic opportunity for the kids to walk away equipped with more knowledge, straight from some of the best experts on the subject. With such a great turnout, this is a tradition we will continue to uphold, ensuring these star athletes can continue doing what they love for years to come. The handouts that were given to attendees at the injury prevention baseball clinic. Season Finale, Ep 013: Adam Greenberg (Former MLB Player, CEO-Lurong Living)3 Tips For Running Injury PreventionSPEAR On-Call: We’ll Come to YouBaseball Screen Helps Our Youngest Athletes Avoid InjuryHow to Avoid Ski Injuries This WinterPreventing Throwing Injuries: Advice from one of NYC's Premier Sports Physical TherapistsMaxim Editor Has a Ball Getting #backtolife at SPEAR!